The first chapter of Artistic Utopias of Revolt deals with the anti-roads movement in the UK at the start of the 1990s, focusing on the squatted street of Claremont Road in London. The author shows how this occupied area developed the aesthetic and creative possibilities for those places known within the activist arena as ‘liberated spaces’. She studies the way that performative strategies, symbolic features, and aesthetic interventions come together to produce a dissident spatiality and to change the meaning of space. 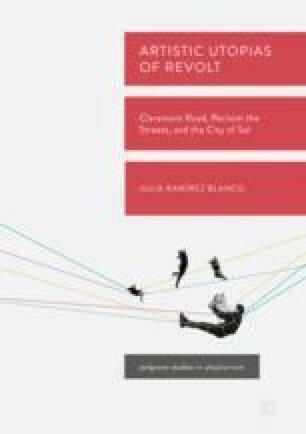 Through an engaging narrative, Ramírez Blanco explains how the various aesthetic elements simultaneously served to create communitarian bonds and to defend the place from police incursions.